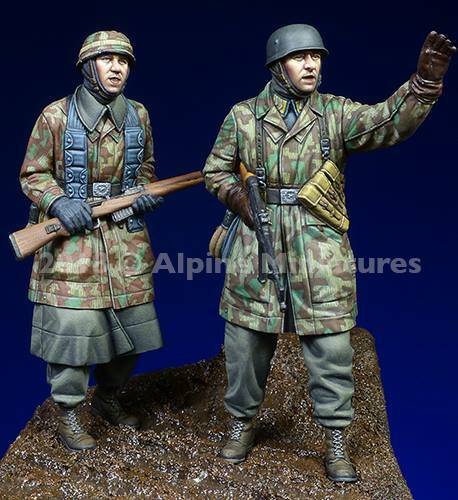 Alpine Miniatures has delivered again it seems. 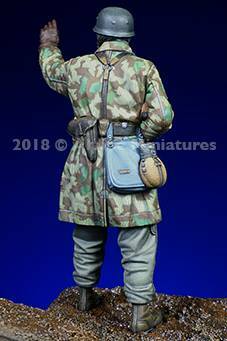 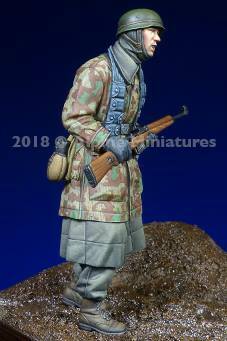 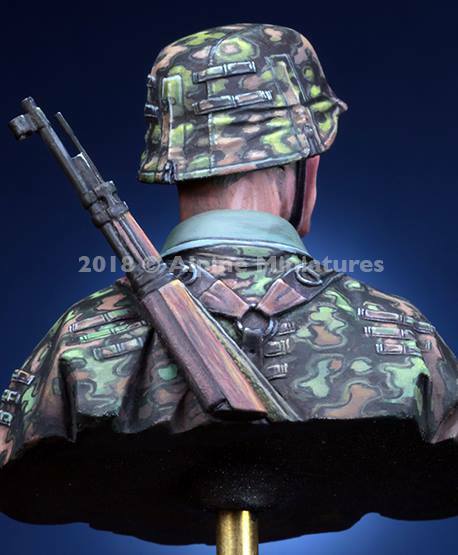 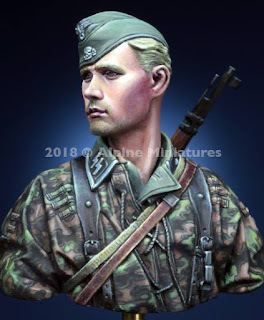 We had been keeping an eye on these two figures of Waffen SS of German Paratroopers and this bust of a Waffen SS man from the late war 44-45 period during their sculpting by Taesung Harmms on the Alpine Miniatures Facebook site. 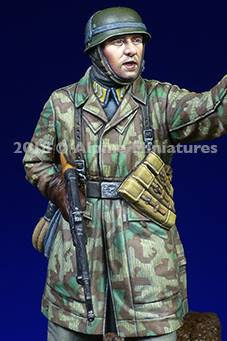 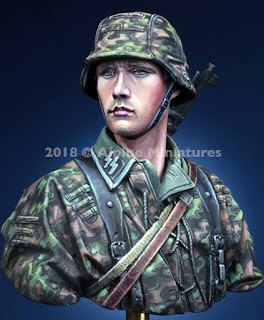 This late WWII Waffen SS man is seen in a 1/16th scale bust, sculpted by Sculpture by Taesung Harmms, and in the case of the boxart, painted by Calvin Tan. 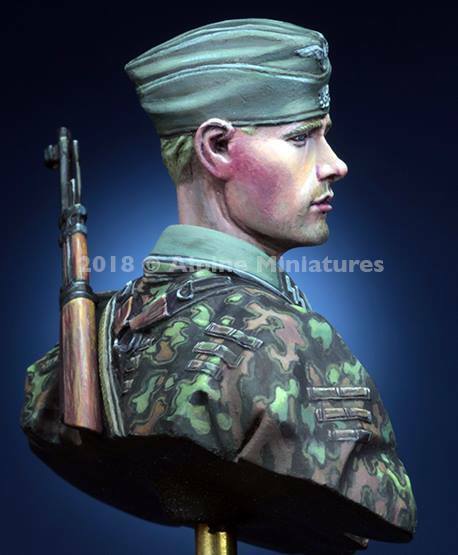 The fine features of this sculpt are brought out in this larger than normal scale from Alpine, and Mr. Tan's painting has really brought his facial features to life. 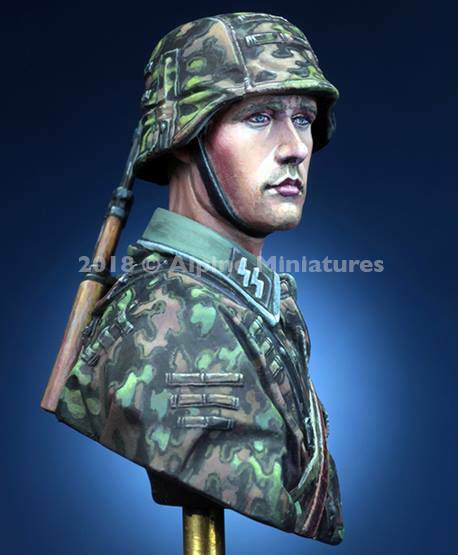 There are two choices of headgear for this figure, M43 helmet with a camouflage covering, this matched the camo on his uniform, which both had little notches in cloth for the addition of local camouflage from the flora around. 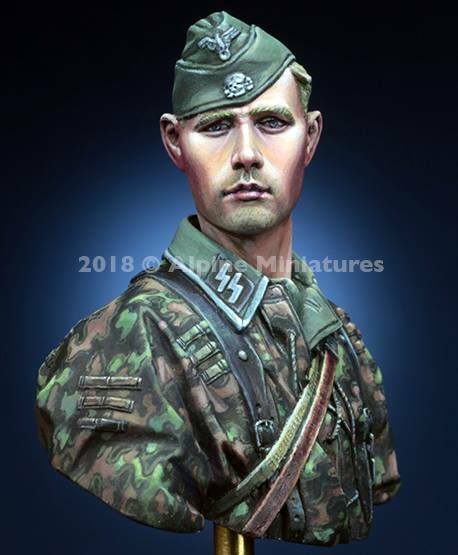 The second choice is the overseas flat cap with the German eagle and the death's head skill in silver braiding on the front. 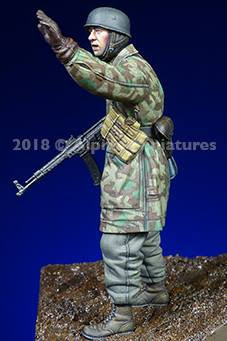 This choice brings out more of his facial features. 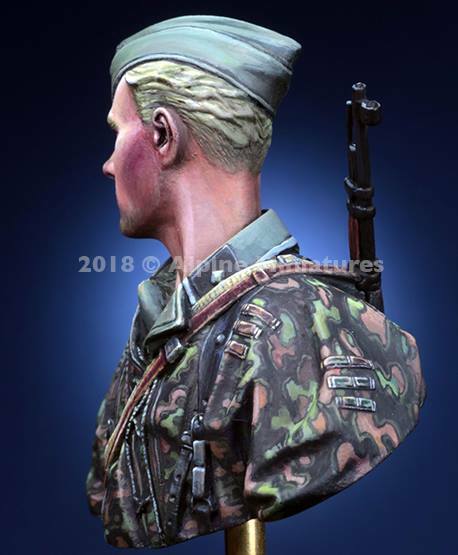 He also carries his Kar 98 rifle which you can see cut off at the bottom of the bust. 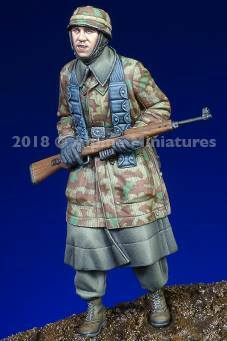 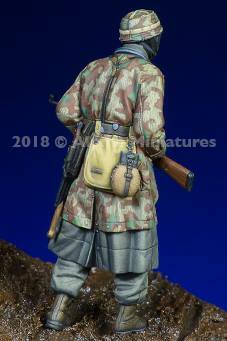 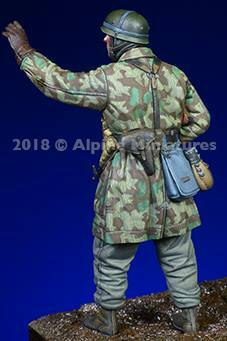 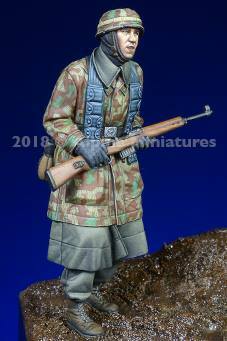 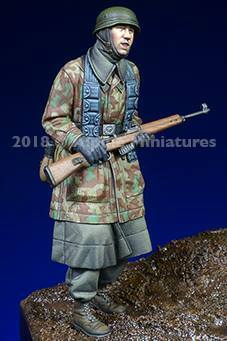 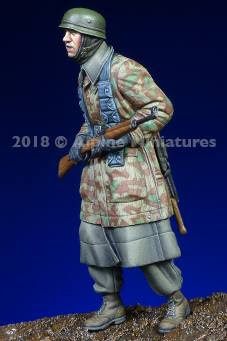 Not a detail was spared in this figure's creation and it is a worthy addition to Alpine's 1/16th scale series - this being the fourth release. This German Paratrooper is seen in a time around the Ardenne offensive of late1944/ early 1945, where these "Green Devils" fought without parachutes as infantry divisions as they did after the costly airborne invasion of Crete. 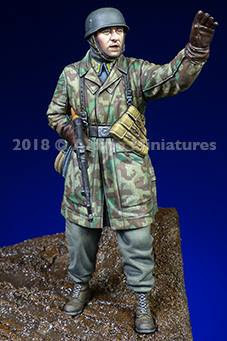 This soldier is wrapped up against the cold of the darkest winter for a few years. 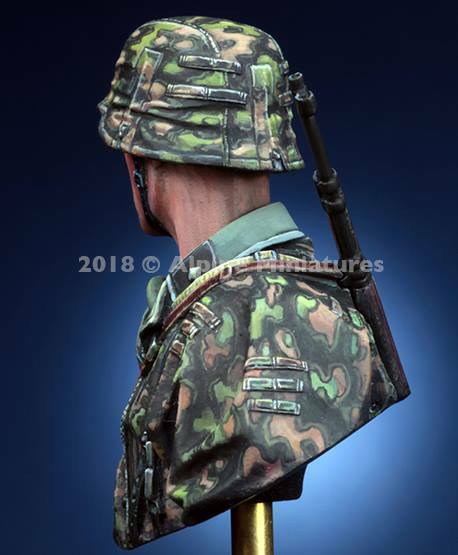 The soldier comes with two headgear choices - the plain steel helmet with a strap to hold camouflage and cloth. 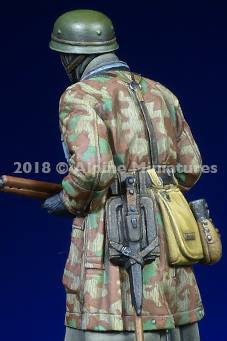 The second headgear choice is the same shape steel helmet, but this time, with a cloth camouflage splinter covering and canvas strap around that. 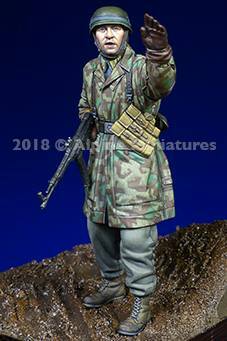 The same face, wrapped in a warm face covering to keep him warm, but a different choice that can make a difference between these choices. 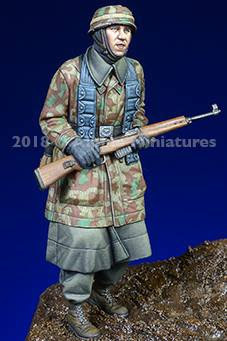 The soldier is seen advancing with his Gewehr 43 semi-automatic rifle with a short mag clip. 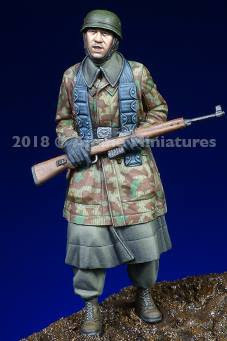 A popular weapon for soldiers of the German forces after it's inception in 1943, the Gewehr 43 is a 7.92x57mm Mauser calibre semi-automatic rifle developed to counter the need for more firepower for the often outnumbered German troops at that time of the year. 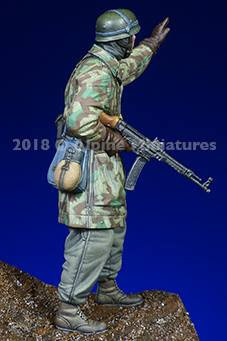 The development of a multitude of semi-automatic weapons and fast firing light machine pistols especially by the Soviets and Americans meant that these rifles were well received by their users. 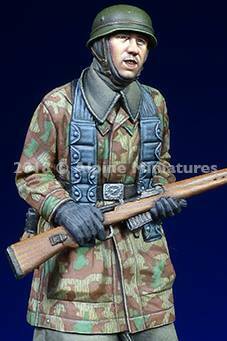 Down his chest are hung (over the shoulders actually) his ammunition pouches for his rifle. 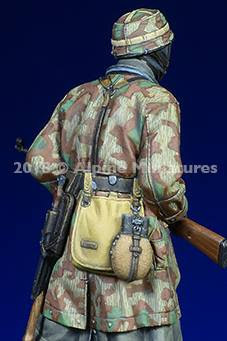 The man's belt attaches to his combat "y-harness straps". 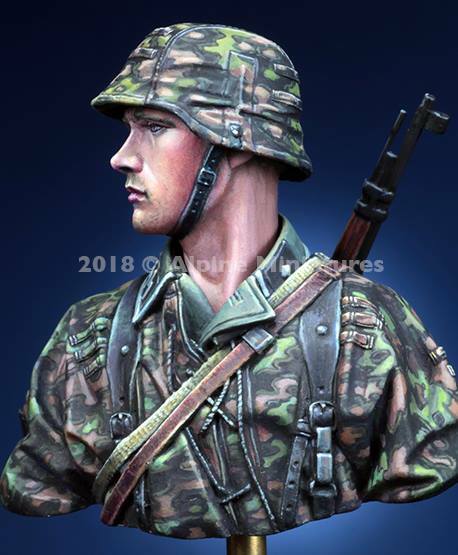 (Koppeltraggestell für Infanterie) on which all of their equipment is attached. 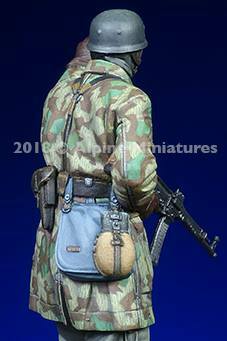 He carries the M31 canteen & cup. 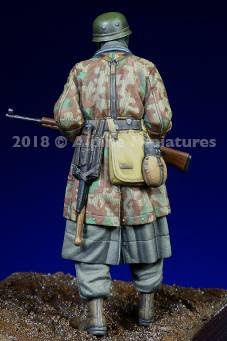 (Feldflasche 31 und Trinkbecher) as well as the M31 bread bag (Brotbeutel 31) and lastly his entrenching tool and bayonet secured way safely in there. 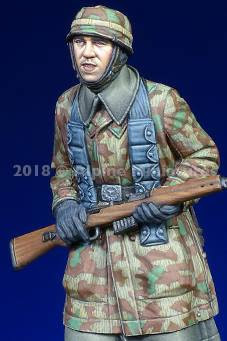 This soldier - who I think looks a bit like Kevin Spacey (that adds a twist to this story) is seen in two different headgear choices, both are again the steel parachutist's helmet, one with the straps over the top to hold the cloth camouflage or any close by flora to it. 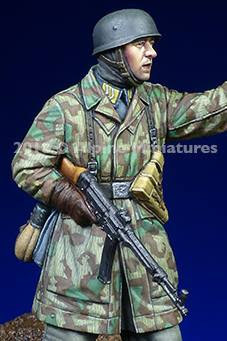 The other is a bare helmet choice, you could leave this in it's painted state or whitewash it if you like. 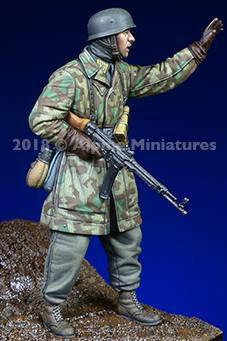 This para carries the much-feared Sturmgewehr 44, the first assault rifle to see deployment on a large scale. 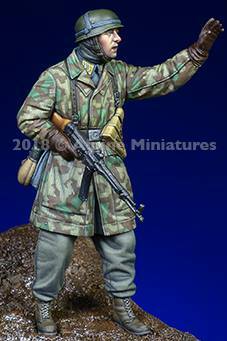 Developed by Nazi Germany, it was introduced in 1943 and first saw service on the Eastern Front. Though far from perfect, the StG44 proved a versatile weapon for German forces and caused much consternation from those who faced them used in numbers, especially by the elite soldiers that the better weapons often went to by the end of WWII. 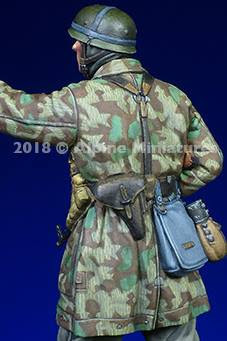 He also carries his ammo for the gun in his pouches on his body harness. 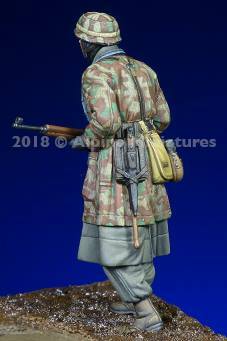 The soldier is wearing the long camouflaged jumps smock over his trousers, over this he wears his belt and Y harness which carries not only a pistol in his holster at his rear but a bread bag and his flask also. 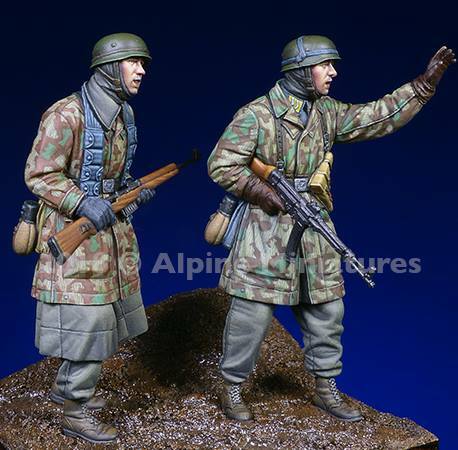 Here these two "Green Devils" together. 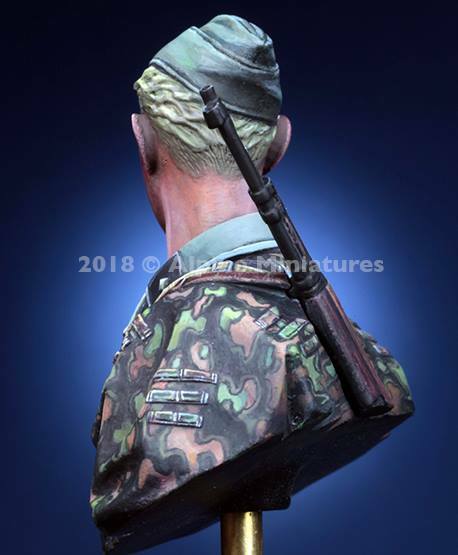 Their body languages suit a pair of men who fought and lived with each other, like brothers through the adversary of war. As is the usual from this manufacturer these two single figures are also sold as a pair in a set. 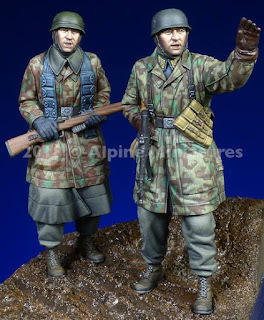 The sculptor has tried hard to make these figures look like they are from a similar time but really are almost dressed in completely different gear. 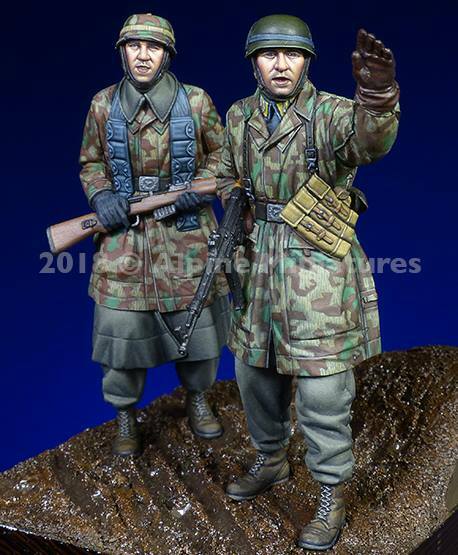 This means you can make them look similar but different, and that draws attention to a small group like this.